Why is Vitamin C important? It is your number one defense against not only colds and the flu, but a wide range of illnesses, including diabetes and even cancer. So why don't more people believe in the power of Vitamin C? The medical establishment tries to discourage people from taking high doses of Vitamin C, arguing (incorrectly) that either: a) Vitamin C does nothing; or b) Taking too much Vitamin C will hurt you. Not true, say research done over the past 80 years by several renowned physicians, including a Nobel Prize winning doctor. 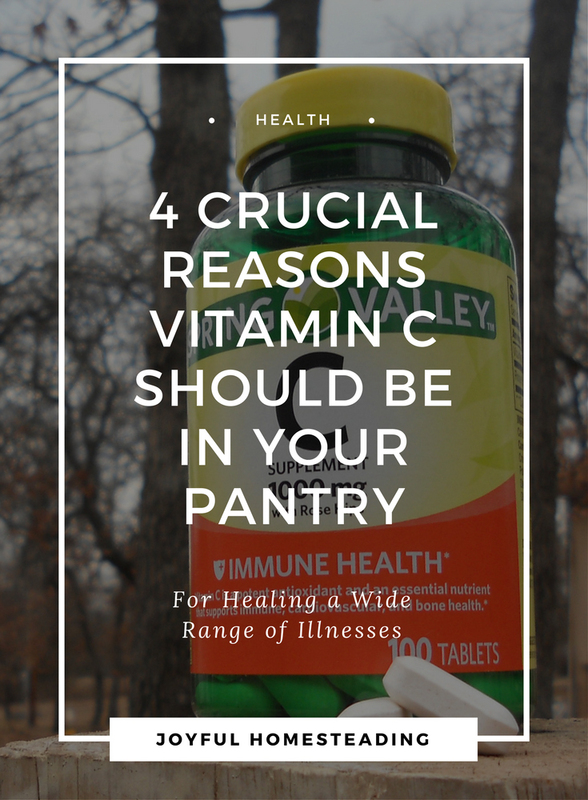 Here are four crucial reasons why Vitamin C should be in your preparedness pantry. Even if you eat a balanced diet every day, you are likely deficient in Vitamin C. Poor habits, such as smoking can deplete Vitamin C from your body. Vitamin C helps oxygenate your blood, so that your heart doesn't have to work as heart to oxygenate the blood. Vitamin C also fights the viruses and toxins in your body. Without enough Vitamin C, you are susceptible to a wide range of infections such as gallstone infections, tonsillitis, and appendicitis. Klenner advocated taking anywhere from 350 to 1,200 mg per kilogram of body weight, meaning that most adults should take between 20,000 mg to 120,000 mg per day. Using Vitamin C, he successfully treated multiple sclerosis, polio, pneumonia and other infectious diseases. Dr. Linus Pauling, who won the nobel prize not once, but twice, once said he wanted the following statement printed on the label of every prescription: "Warning: Keep this medicine out of the reach of everybody! Use Vitamin C instead!" He was convinced that Vitamin C was the answer to virtually every ailment, including cancer. By giving his patients 10,000 mg or more of Vitamin C daily, he was able to successfully treat those with cancer. If you're worried about ebola or some other plague during a collapse, EMP or other crises, then stock up on Vitamin C. It's your greatest arsenal against communicable diseases. Dr. William J. McCormick, an early pioneer in Vitamin C therapy, warned that a deficiency in Vitamin C makes you susceptible to communicable illnesses, including tuberculosis, pneumonia, diphtheria, scarlet fever, whooping cough, rheumatic fever, and typhoid fever. Taking huge quantities of Vitamin C will help heal these illnesses. Dr. McCormick argued that in the 1600s, those with scurvy had a high risk of contacting the plague. He also wrote that the symptoms of scurvy are virtually identical with those of leukemia. Both, he said, could be cured by large doses of Vitamin C.
An insufficient amount of Vitamin C weakens the walls of arteries. Eventually the walls will leak and arteries will bleed into themselves, causing blood clots to form, leading to strokes and heart attacks. Taking large doses of Vitamin C might not only prevent these problems but might also bring about a cure. The worse that could happen is you get the runs. To keep that from happening, listen to your body. When you get tummy rumblings and loose stools, then it's time to stop. That's known as taking Vitamin C to the the absorption rate, or to the point where your body no longer needs any more vitamin C and is expelling it from your body. That means, depending on how sick you are, you might need more than 100,000 mg of Vitamin C daily. Need more convincing? Watch the video below to hear Andrew Saul of Doctor Yourself explain the importance of Vitamin C.